*This fact sheet has been adapted from the National Pork Board funded publication, “Siting and Building Considerations to Reduce Odor Potential from Swine Facilities”. The best time to lower the potential for odor and odor complaints from any swine facility is before the site is constructed. Siting and building design have a tremendous influence on odor potential, not only through position relative to neighbors, highways, parks and municipalities, but also due to the communitys perception of odor potential. There is no one right answer to the question: “How far will odors travel?”, but understanding the factors which influence odor transmission can help to minimize impacts on neighbors. Wind Direction – The predominant direction of the wind during summer months is an important factor in examining the potential impact on neighbors. 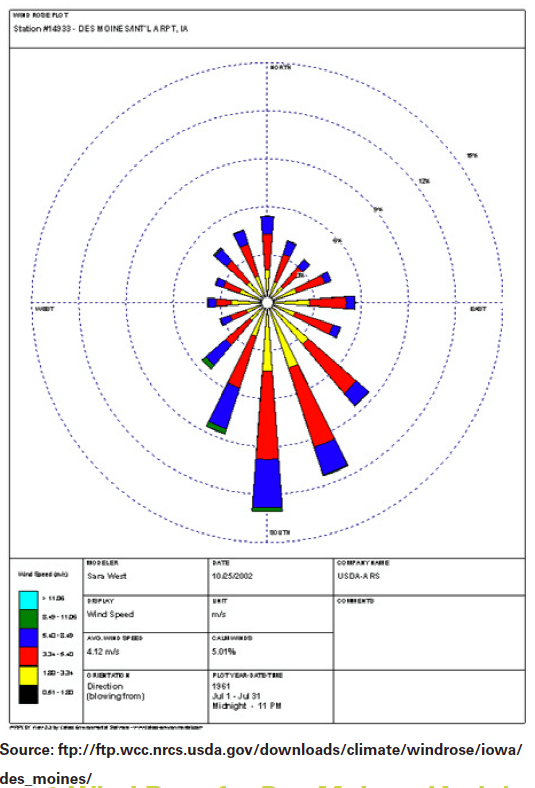 Weather data is used to create wind roses what show the direction and frequency of the wind from compass points. Figure 1 shows an example from Des Moines, Iowa for July. The graph shows that wind originates from the south approximately 13 percent of the time, followed by SSE 11 percent. This means that for Des Moines, locating a swine unit directly south of neighbors would not be wise. Consult wind data for your area before selecting a site. Atmospheric Stability – Weather conditions play a big part in how well odors are dispersed. When it is sunny, thermal currents mix air vertically thereby dissipating odors more quickly. Windy conditions dilute odors more quickly as well as increasing the travel distance of odor. The atmosphere is most stable from sunset to sunrise and on cloudy, relatively calm days. These are the times when odor generated activities should be avoided if possible. While atmospheric stability is not something a producer can manage, it is something that should be kept in mind when siting a building, considering when to land apply manure or in undertaking other activities which may cause an increase in odors. Terrain and Air Drainage – Terrain such as hills, valleys or trees can influence how odor disperses, especially under calm conditions. Near dusk, as air cools, it flows from high terrain to low in the absence of wind. For this reason, placing swine facilities at the top of a hill where air could flow from the site to residences located further down slope should be avoided whenever possible. Trees can cause air currents to raise and swirl, thereby dispersing the odor (Figure 2). Exposure Angle – When siting a building, to minimize the number of hours that wind blows from the source directly to a receptor. The sum of the wind angles when this will happen is referred to as the exposure angle. Figure 3 illustrates that the building site layout, as well as the distance from residences, can impact this angle. The smaller the angle, the less likely wind will carry odor from the source directly to a neighbor. A small exposure angle also limits the view of the site by the neighbor. Distance – Distance minimizes odor potential to neighbors. This not only decreases the exposure angle but also provides an opportunity for more stirring and dissipation of the air plume from a swine unit. In odor transport, there is no substitute for increased separation distance. However, distance to minimize odor potential is not uniform for all directions. Acceptable separation distance for a given direction will be a function of wind patterns and terrain. Number of animals – The number of animal units on the farm will contribute to the total amount of odor emitted from the farm. Figure 1. Wind Rose for Des Moines, IA. July. Figure 2. Trees can dissipate odor by forcing the plume to elevate and stir. Figure 3. 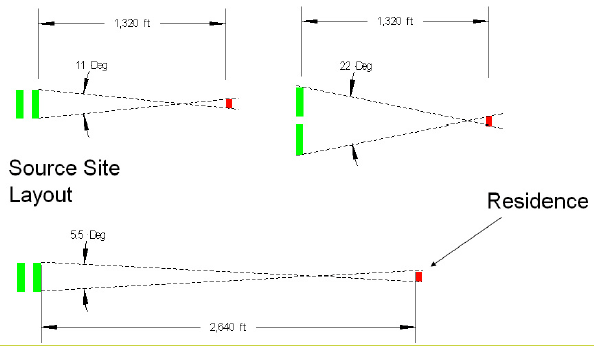 Effect of site layout and distance on exposure angle. Summation of sources – The total odor level that neighbors might face is an important concern and not just what a new facility adds to it. Consider the situation in which neighbors receive some level of odor from other nearby swine farms and have been understanding of their potential contribution to an odorous situation. A new facility constructed in this area might impact the neighbors very little, yet the additional exposure may take the neighbors from a tolerable situation to one that they feel is a nuisance. Public Venues – Avoid areas near parks, churches, cemeteries and highways. People typically react strongly to odors in areas in which they go to relax, spend family time or participate in community activities. Odors in these areas are not well received and impact the public image of the swine industry. Visibility and Site Aesthetics – The old saying “out of sight, out of mind” is truer than many people realize. Facilities that are blocked from view generally have fewer complaints than ones that are near roads or are visible to neighbors. Trees help to hide facilities although care should be taken to avoid disrupting the flow of air to naturally ventilated buildings. A well-mowed and landscaped site can also deter complaints. People often associate a well-kept site with a well-run operation. Provide a screened area for mortality pick-up also. Manure Storage – Uncovered outdoor storage of manure allows wind to blow across the surface creating a large plume. For that reason most people choose to store manure below the building in a deep pit or cover their outside manure storage or anaerobic lagoon. Covers can be expensive and require periodic maintenance. Deep pits are easier to maintain but present a potential hazard in the building from gases during agitation and pump-out periods. Ventilation Issues – Ventilation is a considerable issue because air leaving the building carries odors, gases and particulate matter. Proper ventilation is critical also to animal health and worker safety. Natural vs. Mechanical Ventilation – In many parts of the country, naturally ventilated or curtainsided barns are preferred by producers. These facilities provide a good environment for swine, but because the air exits from relatively large openings, it may create a relatively large air plume and is difficult to treat for odor. For instance, a 40-ft wide, 1000-head finishing facility can have a sidewall opening of nearly 800 square feet. In comparison, mechanical systems provide the opportunity to direct the air away from neighbors and provide centralized areas where exhaust air can be treated. However, mechanically ventilated buildings use more electricity and require more equipment and expense than naturally ventilated buildings. Biofilters – Biofilters may be attached to the fan housing to filter exhaust air and remove most of the odorous compounds from it. Studies have shown they can remove more than 50 percent of odor when properly maintained and operated. Biofilters are generally made of wood chips and are designed to retain the air in the filter for 3 or 4 seconds. Biofilters are effective, but can be quite large and require maintenance. Care should be taken to design and install biofilters in a way that does not reduce ventilation appreciably. Biofilters require more pressure than just exhausting air to the environment and some fans may not be designed to operate under these conditions. Biofiltration of pit fans can be a good partial treatment option. Chimneys – One way to minimize odor potential is to avoid creating a plume which flows toward neighbors. Exhausting air vertically rather than horizontally through wall fans can allow the plume to vertically disperse more quickly. Chimneys should be taller than the peak of the roof. Fans can be installed in chimneys or chimneys can be built around wall fans in order to direct air upward. Naturally ventilated buildings use chimneys quite often for cold weather ventilation but most air is exhausted through sidewall curtains rather than chimneys, especially during warmer months. Building Size –One large building may seem less obtrusive to neighbors than a building site complex involving several buildings. This may actually have a minor impact on odor dispersion and care should be taken to first abide by biosecurity and ventilation concerns. Color – Some members of the public think that white steel buildings are an eyesore and may affect the perception of the site. Light colors such as tan or light brown may reduce this concern. Consider the siting and design of swine buildings before construction to lower odor potential and odor complaints of the swine operation. Several factors impact the zone of influence of a swine production site on odors. These include predominant wind directions, atmospheric stability, terrain and air drainage at the site, exposure angle of the buildings and distance to neighbors. In addition, producers need to realize that they need to consider factors that can impact the community near the proposed site. These factors include considering if the new buildings will add to other current odor sources, is the proposed site near public venues and will the proposed buildings be visible or will the site present pleasing aesthetics. Specific building design considerations to minimize odors include decisions about the type of manure storage facilities, ventilation system, building size and color of the building. Mikesell, R. E. Evaluating proposed swine operations for potential odor conflict. PIG 10-04-01. Nicolai, R., D. Schmidt and K. Janni. Biofilters for odor control at swine facilities. PIG 09-07-05.